Kiss and Hamilton and Shakespeare, really? OK, so a famous rock and roll group, a mega-hit musical and a play that has inspired musicals and operas may or may not appeal to different audiences. But they all are Chicago performance news. The internationally renowned Chicago Shakespeare Theatre is returning for a sixth year to put on a free show in Chicago’s city parks. This year, the production is a 75 minute version of “Romeo and Juliet,” William Shakespeare’s famous tragedy of two young lovers from feuding families. Starting off at the just completed Polk Bros Park at the entrance to Navy Pier, performances will be at 7 p.m. July 26-28.. From there it will move to 17 Chicago neighborhoods through Aug. 27, 2017. Shakespeare in the Parks has been the basis for 1,300 free Chicago ark District’s “Night Out in the Parks” summer events. The free Shakespeare shows is possible through a partnership of Chicago Shakespeare Theater, the City of Chicago, Chicago Park District, Boeing and BMO Harris Bank. For a list of parks and dates visit Chicagoshakes. “Memphis Tony nominee and Drama Desk Award winner Montego Glover will be taking the part of Angelica Schuyler in the Chicago company of “Hamilton” in early September, according to producer Jeffrey Seller. In addition, Broadway cast member Gregory Treco is moving to the Chicago company to play Aaron Burr Sept. 8. 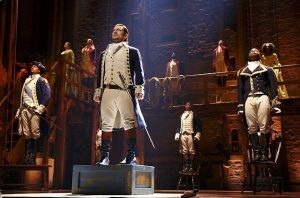 “Hamilton,” the mujlti-Tony Award winning musical by Lin-Manuel Miranda, is at The PrivateBank Theatre, 18 W. Monroe St., Chicago. A touring company will open in LA at at the Pantages Theatre Aug. 8, 2017. Historian Ron Chernow’s “Alexander Hamilton” a biography about the West Indies immigrant who instrumental in the Revolutionary War and became the first US Secretary of the Treasury. Aurora’s RiverEdge Park hosts 2014 Rock and Roll Hall of fame Kiss for a spectacular “Shout it Out Loud” concert. 8 p.m. Aug. 20, 2017. General admission is $70. A VIP Meet and Greet packageof perks is $1,250 and a less expensive VIP package is $325 (fees extra). RiverEdge Park is at 360 N. Broadway, Aurora. For tickets and other information call (630) 896-6666 and visit RiverEdgeAurora.